State design decisions throughout the design process. List any special features and alternatives that were considered. Provide a written narrative accurately addressing the electrical and telecommunication design. Describe the design approach to all electrical systems. Include the method used for sizing conductors, conduit, protective devices, and other equipment. When tables from industry standards are used in the design, it indicates the title, source, and date of the document. Include a complete list of all design standards and references used for the design. 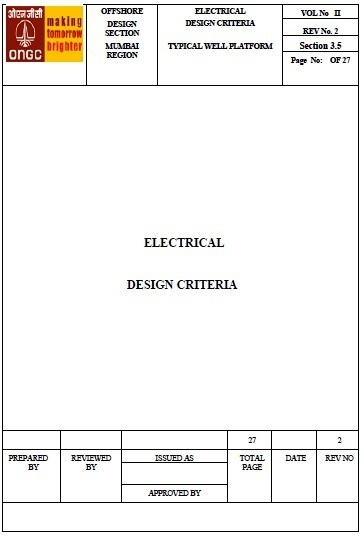 How to write Electrical Design Criteria? 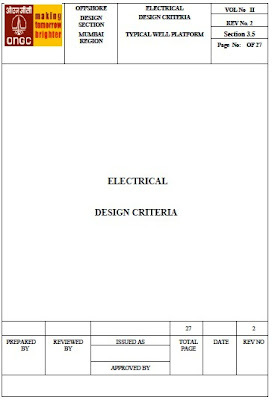 A standard electrical design criteria Include the information in the following sub-paragraphs as a minimum. 1.1 Scope :Indicate the objective of design criteria. Example: This document summarizes the codes, standards, criteria, and practices that will be generally used in the design and construction of electrical engineering systems for the Project. 1.2 Project description: Introduce a short summary for the project. Example: the project is a high-rise office building with shopping arcade, it has 10-story building (12 floors) with a floor area of approx. 25 m x 60 m. There is a car park for customers in front of the building, the access way to the parking garage (levels -1 to -3 for employees) and a fountain (80 m x 20 m). Real floor area approx. 1350 m2 (14 levels + technical equipment on roof level). Floor heights of levels 00 to +10: 4 m, levels -1 to -3: 3 m.
Indicate Environmental and topography conditions at the project area, all equipment shall be suitable for operation at these conditions. Design Noise level: NC 60-65 Sound absorbent material in rafters. List the definitions of all terms and Abbreviations hat will be used throughout the design criteria document. 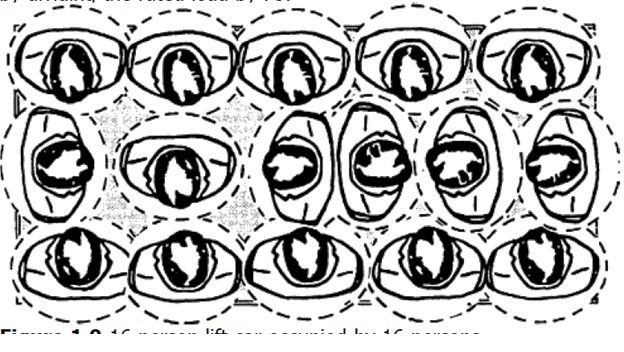 Identify the location of the point of connection into the existing primary system. Standards of Design :Describe pertinent standards of design, such as voltage drop, and equipment ratings. voltage designation and levels: Provide basis for selection of primary and secondary voltages. the circuit grounding classifications (ungrounded, uni-grounded, resistance grounded, or multi-grounded). Address the adequacy of the primary system; if inadequate, state measures proposed to correct the inadequacy. System Maintainability: Design the system in a manner that facilitates periodic maintenance of the equipment. Provide an estimate of total connected load (kVA) and the resulting demand load (kVA), transformer size, and service size. 5.3 Address the characteristics of Main Service Equipment (MV switchgear, Transformers substations, metering). Include conductor size, type, number of conductors, insulation voltage rating, and insulation level. Describe pertinent standards of design, such as voltage drop and equipment ratings. Describe alternate energy systems such as engine-generator sets, photovoltaic power systems, wind turbines, and fuel cells. Identify point of connection into base system. Describe modifications, if required, to existing base system. Identify any special systems, such as Electronic Security Systems (ESS) or Cable Television (CATV). Describe how and where the facility will connect to the basewide Mass Notification System. Describe types of luminaires and illuminance values. Include conductor type and number of conductors. Describe the proposed standards of design, such as voltage drop, illuminance values, type of light sources, and energy conserving features. physical and electronic security features such as ESS, access control. Indicate the type of wiring method, such as rigid conduit, electrical metallic tubing, cable tray, nonmetallic sheathed cable, and where proposed to use. Indicate the type of conductors and insulation material such as CU, AL, THW, XHHW, and where proposed to use. Describe the proposed type of systems. Indicate each system’s function and the interrelationships between systems, when applicable. Identify government-furnished equipment, if any. Identify special physical security requirements. Other systems as per project needs. Identify space required for telecommunication equipment, and size of incoming duct/conduit. Include documentation concerning telecommunications room sizes, to accommodate interface equipment provisions for multi-use systems (i.e. special use systems, such as voice, video, and data). Coordinate all interfaces with instrumentation and control systems provided by other disciplines, and provide required connections, either empty conduits or power wiring as required. Normally, the designer for the discipline that is responsible for the process (such as electrical, mechanical, or civil) is also responsible for the instrumentation and controls design of that system. Update the design criteria for each stage to accurately show the current state of the design. the design bases (or basis of design) is what the designer will or has developed to respond to and meet the owner's project requirements (OPR), including the design assumptions and design criteria used. so, the design criteria is the first part of the design bases which group All elements of the basis of design that show that the owner's project requirements will be met. the second part of "design of basis" is the design assumptions which include assumptions for calculations, decisions, schemes and system, and assemblies selected to meet the owner’s project requirements and to satisfy applicable regulatory requirements, standards,and guidelines. 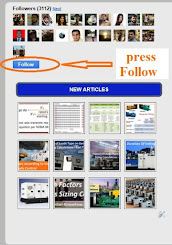 is site is really very useful, all the topics are very well explained.